Victor, you detailed the dash install very well. Any details and photos on installing the console and shifter? What does the new console mount to? Could you post a photo and circle what pulley needs to be cut? After several requests for more info on the floor (center) console and what I did to make it fit, here are some more pictures. The Parking Brake bracket doubles as an adjustment feature for the cable coming from the foot brake. It also serves as a mounting provision for the steel rack that sits above it. It needs to be trimmed to its smallest possible size yet still retain the parking brake function. Here is what mine looks like after I trimmed it. Also shown in the picture above are the left hand side steel tabs that come off the trans tunnel. These tabs are common to the Chevy SS and is where the floor console bolts to. There are a total of four mount tabs that correspond to the floor console. On the console itself, the attachment holes that you bolt through are common to the plastic duct in the console. Unfortunately I sacrificed the ducting function and cut away the duct to make room for the brake mechanism. The idea is to cut enough away to clear the brake bracket when you place the console over it. There are two options. The first is retaining the four mounts which requires cutting away parts of the duct to clear the brake bracket while leaving the forward attachment lugs. 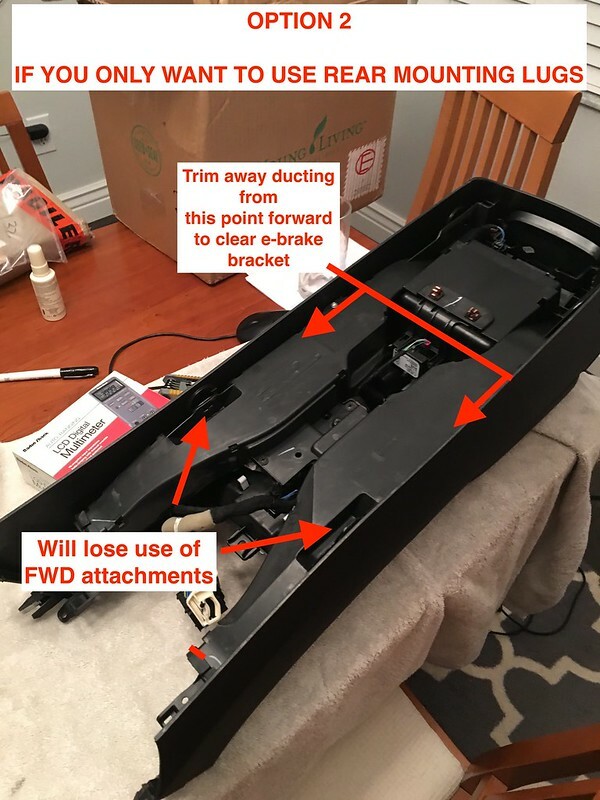 The second and cleaner way is to cut out the entire forward sections of the duct and loose the forward two attachment points. This isn't a big deal since the front of the console is clipped and bolted to the dash panel. Here are the two options. How much of the duct did you have to clear out of the floor duct for the center console in order to mount it to the floor? 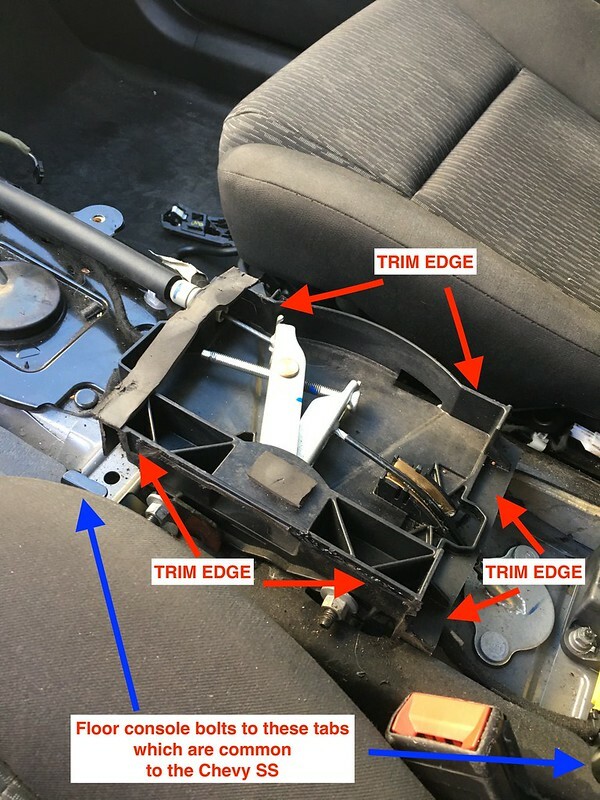 I am working on putting in the ss dash and center console in my 2014 Caprice and I am having issues getting the center console to sink far enough down.